From now until 31 August 2013 (or while supplies last) Stampin' Up! 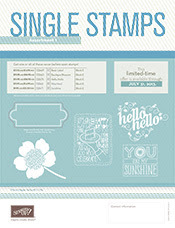 is excited to offer 5 single-image stamps for you to choose from! See the flyer here.